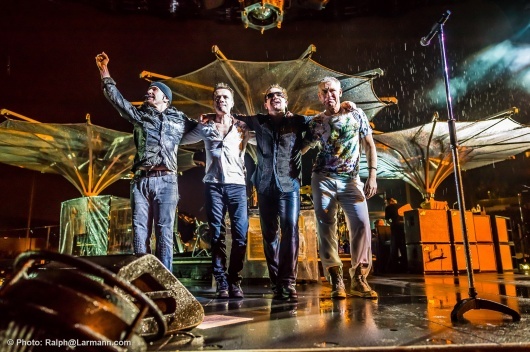 English translation of the review of "Um die Welt in 760 Tagen - U2 – Die 360° Tour"
Can you really bestow 256 pages just on a concert tour? This is the question that comes to mind before reading “From the Ground up.” But then you realize very quickly that Dylan Jones and Ralph Larmann do a very good job and succeed. And well, we’re talking about the 360° tour after all... GQ editor Dylan Jones and famous German concert photographer Ralph Larmann have created a book, which has to be considered as more than merely a photo book. Not only do overwhelming photographs deeply impress, no, this book is particularly fascinating as it tells the story of the 360° tour from different perspectives and, thus, the story beginning with Bono’s vision, followed by travelling across the world while meeting several obstacles and finally wrapping up in Moncton, New Brunswick. 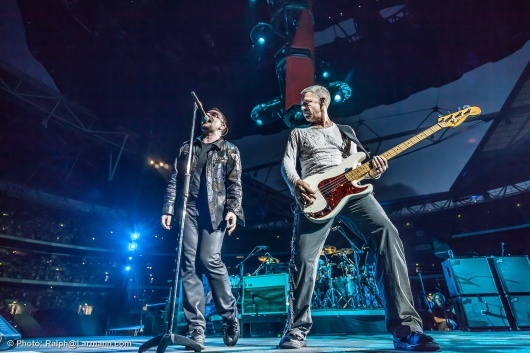 In general, the book can be seen as a worthy follow-up of U2 by U2, the book documenting U2’s career chronologically from their early days to the Vertigo tour. “From the Ground up” is now completing the story of the band’s career up to no by adding the distinctive new chapter we tend to refer to as the monster tour with the monster stage. The narrative of Dylan Jones, who joined the band on the road, is supported by a number of long quotations of both, many of the tour’s protagonists and also the band - this reminds of U2 by U2 as well. Quite surprisingly, Adam seems to be the one contributing most, even more than Bono (or at least it feels like that), whereas you will not find any comments and opinions from Larry at all. What might be even more interesting, however, are the statements of other important people involved in the tour. 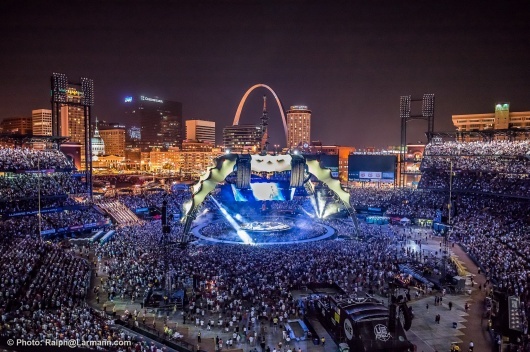 Paul McGuinness and Arthur Fogel (Live Nation CEO) discuss the business side of the tour. Additionally, Willie Williams, sound engineer Joe O’Herlihy and Jake Berry (Production Manager) share their impressions and stories and, hence, contribute fundamentally to the multi-perspectivity making this book so great. Unlike U2 by U2, the sometimes long quotations are embedded in Dylan’s running-text, which might confuse the reader at some points, raising the question as to who is actually talking at the particular point. All in all, the narrative style creates an atmosphere that equals a comfortable evening in a pub: A bunch of old friends hanging out together, having two, maybe three or even unlimited rounds of Guinness and sharing their mutual memories of the adventures they experienced together back in their good old days, which shall never again repeat themselves. 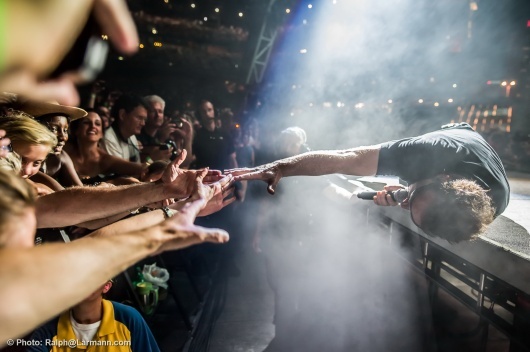 The whole sentiment occurring around our interview with crew member Arne back in April 2011 gave us the impression that the 360° tour was more than just a simple concert tour for everyone involved. This book confirms this impression once more. The front page photograph alone, depicting the crew members hanging from the video screen, suggests this kind of feeling. What is probably most striking in this book are the detailed information and the many little side plots, which make the book especially interesting for fans. Would Mark Fisher and Willie Williams be able to create innovation ever again after Popmart and Zoo TV? The reader joins Williams on his creative journey on creating the world’s most gigantic stage, frequently being interrupted by technical difficulties, which are always overcome and solved by innovative ideas. Additionally, the book provides a large number of interesting early drafts, computer animations and models of the stage. We are also given some new insights on how the band felt on stage and what sort of rituals they have prior to a show, some not even known to die-hard fans. Also, we learn about lots of interesting trivia, e.g. information on the crew’s 16 different walkie-talkie channels or why on earth they would transport a Belgian office door to Helsinki. And did you know that in Barcelona a street had to be asphalted solely for the purpose of the U2 shows? Bono’s late insights about how painkillers interact with alcohol or that one is not supposed to hit the bottle hard while having serious back pain are, in a way, amusing as well. At some points, the statements are surprisingly frank, at least for an official publication. It is, for instance, stated clearly that “there was not a single song from No Line On The Horizon that got the crowd really going.”* Furthermore, the tax protests in Glastonbury are mentioned openly and without any attempts of justification. In general, it is evident that Glastonbury is considered to be of fundamental importance for the tour. A large part of the introduction is about Glastonbury and, additionally, the festival gets its very own chapter. Starting into new dimensions: The biggest show on the planet? It is striking that, apart from the titles, the last show in Moncton is not mentioned once. Instead, the two shows in Montreal are emphasized as the important last big shot before hitting the seven remaining cities. As a result, one could think that the tour wrapped in Montreal, thus, it somewhat feels as if the final part of the story was missing. The photographs, of course, are an integral part of the work. These alone would justify acquiring this book. Often, Ralph Lahrmanns’ and Eoin McLoughlins’ giant and gigantic pictures make whole pages and double-pages. The way, for instance, they manage to visually capture the whole atmosphere around the Moscow gig is nothing but remarkable: An army of armed-police men lined up in front of the stage showing “flawless democracy” rearing up its ugly head - immediately provoking U2 fans to associate the striking pictures of Popmart in Sarajevo. In fact, however, it is the stage that dominates the pages. Whether it is “the Claw” exploding in Soldier Field in front of the Chicago skyline, the “space station” as seen from above in Toronto’s CN Tower or in front of the Gateway Arch in St. Louis or the massive “spider” between the huge golf-club-like lamp-posts of Horsens’ CASA Arena completing the idyllic picture under a dusky Danish sky – each photograph conveys a completely different atmosphere, yet always spectacular. What is most striking about the photographs is that they often, quite impressively, capture the interaction between different elements of size: football stadiums, large crowds of people, the Claw (and somewhere there in between the band) all melt together to one single element that can be described by just using one word: giantism. But still, the band itself does not get lost in the giant madness. Larmann particularly succeeds in capturing the band in action, often seemeing in perfect harmony with parts of the stage. Quite frequently, the viewer might even get the feeling that they would jump right out of the book any moment as for their enormous joy of playing live. It soon becomes clear that Ralph Larmann must be the Willie Williams of concert photography. 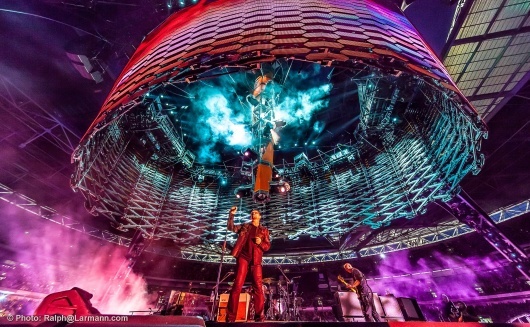 Sometimes the photographs really seem like “punk rock from venus” (as Bono described the music of the following album in pre-release interviews in 2003) as the stage, preferably captured from unusual angles, evokes a futuristic visual overkill, almost incompatible with human logic. People who have not seen the show might even be utterly overwhelmed when looking at some of the photos. Yet, this is exactly why many of the pictures are so fascinating. “From The Ground Up” is full of superlatives. The most successful tour, the most gigantic stage, the largest stadiums, the biggest crowds. Well, one might tend to think that this is appropriate, given that the 360° tour, in fact, can only be properly described by using superlatives in terms of gross, ticket sales, size or whatever figures there are. However, the book reaches a point where all the glorification is starting to get unnecessarily annoying. If comparatives of superlatives were possible, Jones would not hesitate to use them. The feeling of arrogance sets in, especially when the tour is being hyped on the expense of other artists. In the intro, in particular, it is proclaimed ostentatiously that U2 took the Rolling Stones’ crown in the battle of claiming the biggest tour in history. Plus, Pink Floyd’s The Wall is compared to a village fair or it is said that U2 put Muse back in their place. With such unnecessary cross-references, the book reveals a touch of arrogance. But that is the only negative point about this book, which is really enjoyable in general and worth reading. Conclusion: Let’s just skip the part where we would say cheesy stuff like “this book sets fans’ hearts racing” and move on to the part of us saying that fans of the tour will do a backflip out of joy. Regarding all the gigantic photographs and the detailed information on the tour, the book can almost be seen as a masterpiece, capable of capturing the tour exactly the way it was: big, gigantic, great, unique. It’s a must-have for fans, as it evokes personal memories: The moment you finish it, Elton John’s Rocket Man will inevitably pop up in your head and you get that feeling from earlier, when you just came home from an amazing school trip with your friends and now have to be with your boring parents again. In U2 terminology this is called the post tour blues. * Please note that these parts of the text are translated from the German version - the English version published might differ. Translation by Christoph Beller with Hanna Pallua and Sabine Schieweck.